Carrying on 6 months removed from the ending of Splinter Cell: Conviction, Sam Fisher now runs his own PMC (Private Military Company) called Paladin 9, with his old friend Victor Coste. As the duo prepare to depart from Andersen AFB (Air-force Base) in Guam, they are attacked. The entire base is destroyed after the two are assisted in their escape by hacker Charlie Cole. Coste risked his life to save Sam by shielding him from a grenade blast, garnering sever injuries. Those responsible for the attack make themselves known as ‘The Engineers’, who state that this was only the first in a weekly barrage on American assets they call ‘The Blacklist’. Their request? The U.S. government must withdraw all active troops posted in foreign lands. This immediate threat leads President of the United States Patricia Caldwell to reach out and reinstate Fisher, but this time as the commander of a new special ops unit – Fourth Echelon. Joining him on the initial crew is tech specialist Charlie Cole, former CIA officer Isaac Briggs and technical operations manager – and all-around manipulator (play through to Conviction‘s ending if you haven’t) – Anna Grímsdóttir. It’s an understatement to say that Sam doesn’t exactly trust her yet, but revels in the opportunity to technically be her superior. The plot is classic counter-terrorism, but the weekly counter and naming of each attack – American Power being the inaugural affront – gives a feeling of dread and theatricality to the story, though in a good way. The campaign itself is relatively short – unless you are as awful at being effectively stealthy as me, having to continuously restart checkpoints to achieve set bonus objectives – but is supplemented by the 4E side-ops, each group of which have their own mini-story (more on them in the gameplay section below). The simultaneous quests to prevent ‘The Engineers” success and shut down all current operations being conducted by the corrupt Third Echelon agents take the team to the Middle East, South and North America, and reunite them with criminal leader-turned informant Andriy Kobin, who is somewhat neutered after enduring Sam’s interrogation methods in Conviction, and being locked up in the Paladin airship’s holding cell for pretty much the duration of the game. 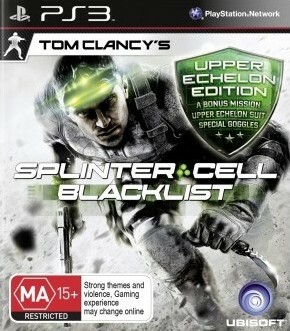 Splinter Cell: Blacklist‘s gameplay is an amalgamation of previous Ubisoft titles, whilst also seemingly taking inspiration from outside developed games. Now, this is not necessarily a bad thing, but it does reduce its sense of identity. Firstly, there is no main menu screen to speak of, with all options interact-able through the Strategic Mission Interface (SMI) on your mobile base, the Paladin. It is your hub of activity: UPlay challenges, campaign missions, 4E side-ops and Spies vs Mercs can be accessed through ShadowNet on the over-world map. There are also daily meta-games that involve you reading and piecing together clues (will require Google searches) in order to find the next location on the map, which you must do with the cursor until you eventually reach the conclusion, choosing between two decisions that could net you a 0.5x earning multiplier if the correct choice is made. Stationed on the plane are the aforementioned members of Fourth Echelon, each of whom can be spoken to, giving updated responses relating to the events unfolding in the story. Along with the 4E side-ops missions they provide – which can be played solo, local or online co-op (except for Briggs’, which are strictly co-op) – they also offer individual opportunities to check your progress (Briggs), update the plane (Grim) and your weaponry/gadgets and gear (Charlie). Grim’s side-missions revolve around silent hacking/infiltration, Charlie’s on defeating waves of enemies (Horde-like), Kobin’s on neutralizing all opposition across two segments of a level and Briggs’ on more involved, cinematic, multi-objective and stage missions. Mark and Execute is back and now can be utilised in conjunction with the fresh, fluid movement animations. This ability is called ‘Killing in Motion’ and allows you to move between enemies on the run, sliding over obstacles, taking them down with melee and even grabbing one unfortunate soul, executing two others and automatically snapping the neck of the guy you’re holding. 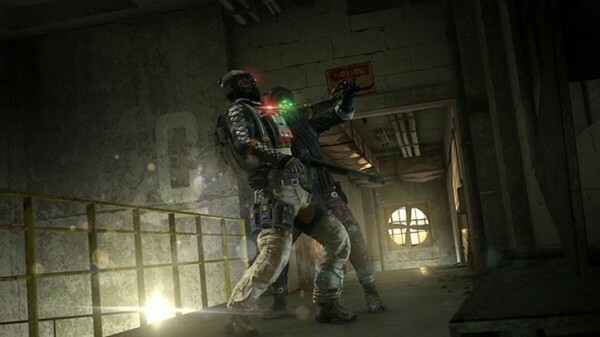 Three play-styles feature in the game: Ghost, Panther and Assault. You can pursue a perfect playthrough of each style, or simply combine elements for a bespoke approach. There are bonuses for achieving certain secondary goals related to these approaches. The game’s Assassin’s Creed-like climbing and Batman: Arkham City reminiscent A.I. speaks to Blacklist‘s varied influences. The A.I. in particular deserves a spotlight; it is highly intelligent and borrows much from the highly-acclaimed Batman: Arkham franchise. Enemies work on audio/visual senses, will notice opened doors when they once were closed, will spot downed companions, try to revive them (if non-lethally stunned, they will be successful) and will then go on high alert, proceeding to patrol the area outside of their usual pathing. On higher difficulty levels, they will provide great adversity. Oh and listen for dogs as they will easily sniff you out. Strategic use of gadgetry in a systemic fashion, such as using a sticky noise-maker to attract an enemy into a puddle, and then shocking that puddle to knock them out, is very satisfying, although sometimes it feels like Fisher may be too over-powered (again, just up the difficulty to alleviate that concern). The fan-favourite Spies vs Mercs mode is back for multiplayer, with multiple variants. Initially, SvM Classic (asynchronous, 2vs2, no customisation) is the only one available, until you reach Rank 5 when SvM Blacklist (4vs4 + customisation), Extraction (defend/extract Intelligence), Uplink Control (mixed teams, 3vs3) and Team Deathmatch are unlocked. Playing the mercenary gives a completely different experience than you would otherwise get as the perspective changes to 1st-person and movement is slowed down. It isn’t an advantage or disadvantage, just an alternate way to play. Gamers should rack up dozens of hours on the fun, sometimes tension-filled multiplayer. There are times when Splinter Cell: Blacklist looks great, mostly in the environments and especially during night-time settings. But, when you play the daytime maps, the lesser graphical quality becomes obvious, and for some odd reason, the facial models of every character look dated. Think Mass Effect but with less emotive capacity. Speaking of, before each mission, the Fourth Echelon crew stand around the SMI table and await Fisher’s command. Here, the camera zooms into Sam’s face as the player is given some options. In this shot, Fisher scans the room with his eyes, left to right, which reminds exactly of Commander Shepard and the look of Mass Effect‘s models. Design-wise, he also bears a resemblance to the ol’ Commander, may he rest in peace. Anyway, getting back on track, the PlayStation 3 version of Splinter Cell: Blacklist comes with a mandatory install at about 8GB. I am not 100% positive of this, but I believe the HD texture pack found on the second disk of the Xbox 360 version is included in this file. Again, the game can look very nice (e.g. above screenshot), but I sometimes had my doubts. There is also quite a bit of screen-tearing present, which anyone who knows me would tell you is my biggest pet-peeve. I hate it. We all do, but I just can’t get over it. On the plus side, the way you almost disappear into shadows is much more natural than how stealth states were handled in Conviction, with its distracting black-and-white filter. 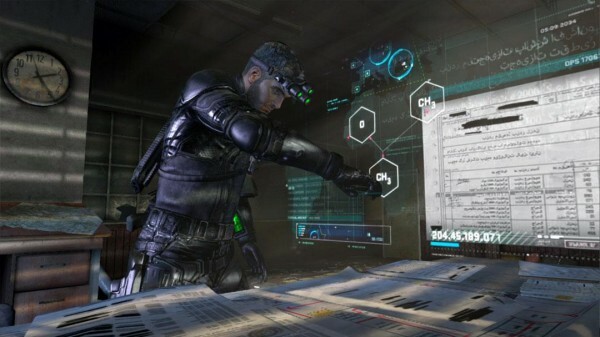 The score for Splinter Cell: Blacklist is what we’ve come to expect from modern-day/futuristic espionage genre pieces, and is not exactly subtle. Action tracks are full of heavy-gain/reverb instrumentation with pounding drums…in fact, that distorted, synthetic sound and strong beat permeate throughout the entire soundtrack.There are many sections of music that have a background ambient track with simple, intermittent pulses of aural attacks. In one instance, a ringing telephone in a level was completely in-time with these attacks, which complemented the tense situation. When you enter the inventory wheel, the music doesn’t dim, cease or just continue at the same tempo, but gradually slows to a crawl, mimicking the slowing of time in the play-space. The music is an active part of the sensory experience and the sound design, overall, is quite impressive here. The sound effects and their implementation really flesh out the world and help develop your spatial awareness. The faint sounds a dog sniffing for your scent, footsteps getting louder and the doppler effect of a passing heavy, breathing in a gas-mask add to the suspense and overall atmosphere. 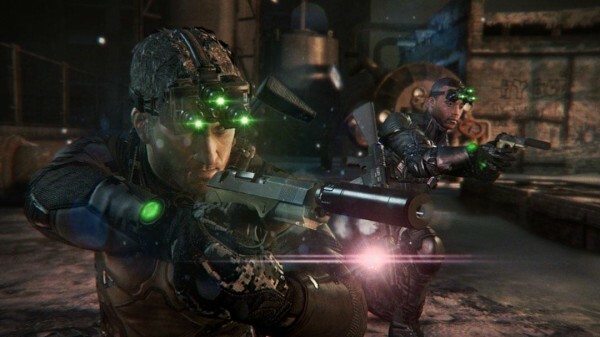 Unfortunately, when it comes to the V.O., fans were right to have concerns when it was revealed that the original Sam Fisher, Michael Ironside, would not be reprising the role. His replacement, Eric Johnson, gives a monotone, flat performance, and yes…he does sound younger. Fisher has found the fountain of youth, apparently. 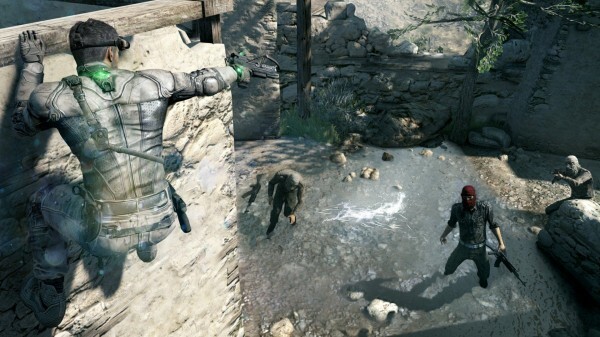 Splinter Cell: Blacklist does an amazing job in giving the player agency in how they want to tackle each mission and situation. 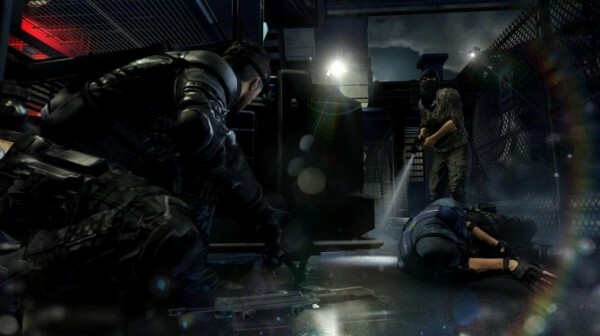 While many will be pleased that the stealth component has been refocused, Ubisoft also kept in consideration the number of players who enjoyed Conviction‘s play-style. The resulting accommodations created the most broadly appealing, yet deep Splinter Cell experience to date. Graphically, it sometimes feels like a step backwards and voice actor Eric Johnson is quite bland as the ostensibly reverse-aging Fisher, but you’ll learn to ignore these flaws in presentation as you embody the spymaster, stealthily dismantling terrorists before blending back into the darkness.